Just be warned that this is definitely a beta version of the app and is by no means official. I’ve tested this twice on my Droid 1 and ran into zero problems. 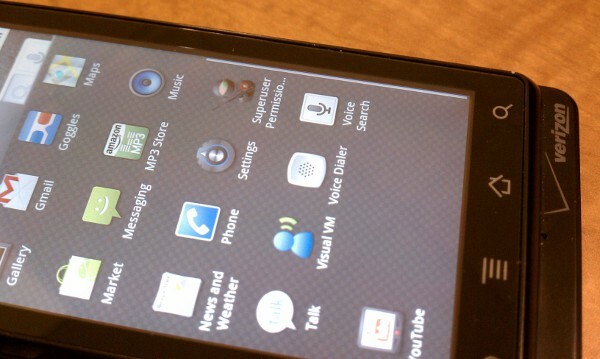 Update: To clarify, I have not tested this on the Droid X or EVO. 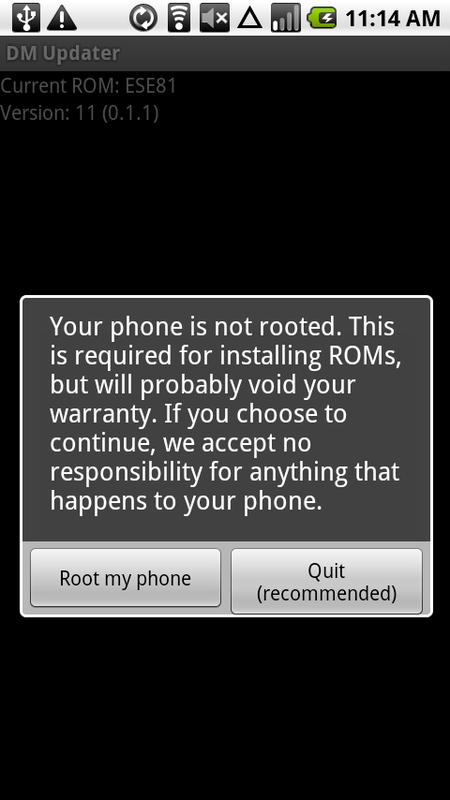 I have no idea if it will in fact root either but have been told it “should.” I only said “root” there, not root and recovery image. Until I get further confirmation, Droid 1 owners should probably be the only testers. Your comments and shared experiences will be greatly appreciated. *Warning* – This will void your warranty, possibly brick your device, and who knows what else. We are not liable should any of those things happen. Enjoy! *The process outlined is for rooting the Droid 1. 1. Download and install the new DMUpdater. Open it. 4. 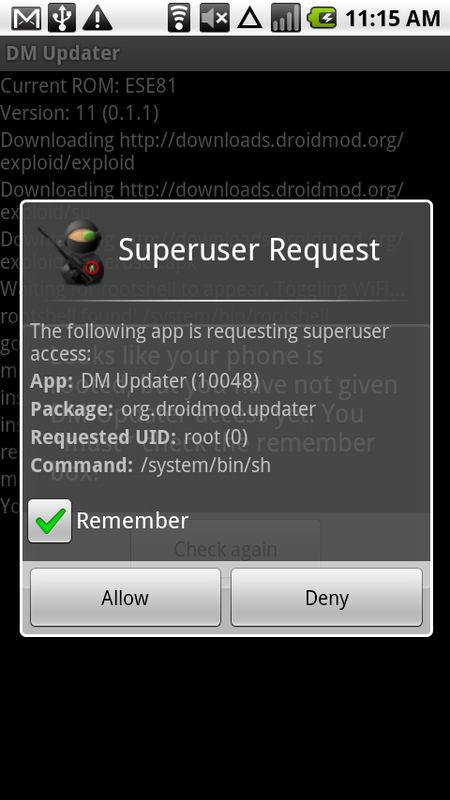 DMUpdater will then prompt you to flash SPRecovery onto your phone. Allow it to. 5. Once that finishes, you are rooted 2.1 with a custom recovery image. 6. Close DMUpdater and enjoy your new phone! 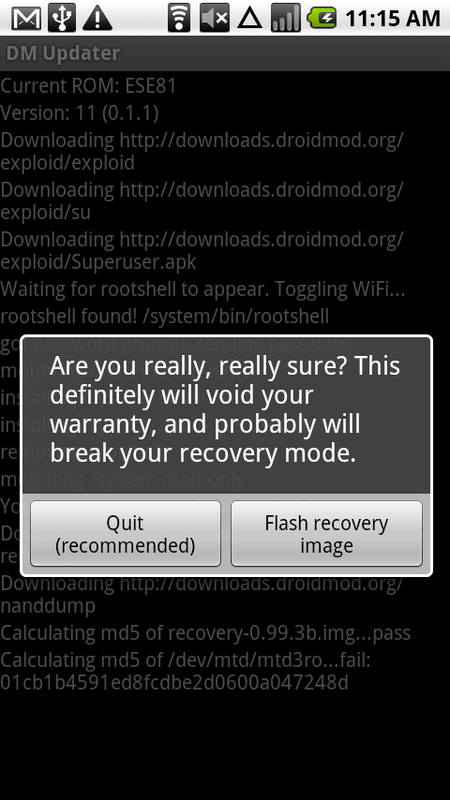 Your next step is to boot into recovery (Power+X) and create a full nandroid backup. From there, prepare to start flashing custom ROMs, having fun with Froyo and so much more. Huge props are in store for the entire DroidMod team, Camel, trevorjay, sgx (tax), [mbm], and birdman for getting the root method to work. Visit DroidMod.org for the future support and an official release of this. You can also find them in IRC at #droidmod.